Pulse width modulation (PWM) is a powerful technique for controlling analog circuits with a processor's digital outputs. PWM is employed in a wide variety of applications, ranging from measurement and communications to power control and conversion. The output of a PWM block is a pulse train. The duty cycle, (the time that a pulse is on divided by the time the pulse is off) is proportional to the value of the input signal if the input is within the range < -input_amp , +input_amp >. For Bipolar PWM the output signal witches between a positive and a negative value. For Unipolar PWM the output signal witches between zero and positive or negative value. An example is shown in the graph below. The parameter input_amp is equal to 1 and the parameter max output is equal to 5. The frequency of the PWM signal is 10 Hz. 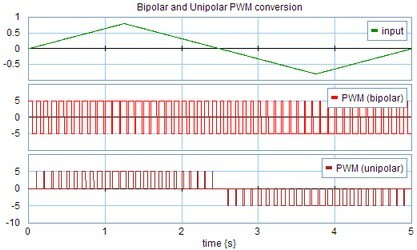 Bipolar and Unipolar PWM conversion. Maximum value of the input signal. The output value will switch between output_amp, 0 and -output_amp.